1. Separate the egg yolks from the egg whites. Beat both separately till frothy and then mix together. Keep aside. 2. Heat oil in a frying pan, add the cumin seeds and fry for 30 seconds. 3. Add the onion, green chilli, garlic and fry till the onion turns brown. 4. Put in the tomatoes and salt and cook till the tomato turns soft and the water emitted from it has almost dried up. 5. 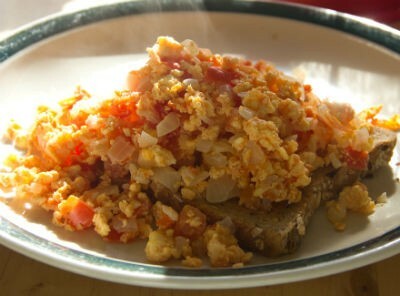 Spread the prepared egg over the tomato mixture and cover the pan with a lid. Cook on low heat till the egg has set. 6. Cut into wedges and pack along with fresh bread slices. Feel free to comment or share your thoughts on this Tomato and Egg Bake Recipe from Awesome Cuisine.